I've been burning things again. Nothing dangerous or fire based, just EPROMS to go to Japan for a certain brewery. 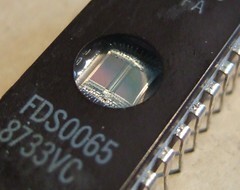 An EPROM (Eraseable, Programmable Read Only Memory) is a memory chip used to hold data, in this case my wonderfully wraught program code. They have a window in the top where you shine UV light to erase them and you have to use a special programmer to put stuff into them. The ones I'm using hold about the same amount of data as a 10 pixel wide column on your video screen (i.e not a lot). Just look at those bits..
EPROMS are hard to work with, difficult to put into the circuit boards and completely superceeded by EEPROM stuff which doesn't need the window (but at least you can look at the chips in these babies). But people will pay me to make them. And soon the code in them will be hard at work putting date stamps on bottles of beer. I love the thought that, even as I write this text there is are programs of mine running in breweries all over the world, putting datestamps on bottles of beer.